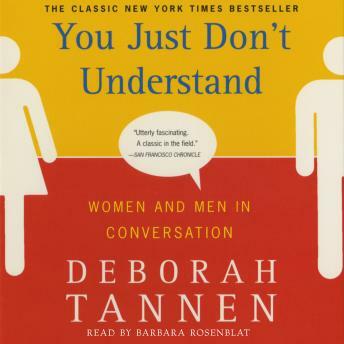 Deborah Tannen's #1 bestseller revolutionized the way men and women talk -- and listen -- to each other -- at home, at work, and wherever the communication gap between the sexes can lead to troublesome misunderstandings. The problem dates back to childhood, when boys and girls learn to use language in distinctly different ways; years later, their adult efforts to talk often place them at cross purposes -- even when both are sincerely trying to communicate. Dr. Tannen illustrates how the best intentions can go painfully awry between spouses, family members, co-workers and friends, With You Just Don't Understand, you'll recognize yourself and your own efforts to be understood -- and gain valuable insight to help you communicate better than ever before.